Merry Christmas! This is the last day of the C# Advent. Make sure to check out all of the other great posts from 2017 and 2018. If you want to be involved next year, look for C# Advent 2019 author sign ups at the end of October 2019, and look for blog posts to start showing up on December 1st, 2019. A background job is some code that runs apart from the normal flow of your program. It could be run asynchronously and/or on another thread. As an ASP.NET MVC developer, I tend to think of it as any task that runs outside of an MVC action being invoked. Scheduled - a task that runs every N minutes, or every Y hours, etc. This is what I’m going to show in this post today. It’s great for making periodic checks, ingesting data from some other source, etc. Fire and forget - Some other piece of code kicks off a process to run in the background. It doesn’t block the code (fire), and the code doesn’t wait for a response (forget). This is great for potentially time consuming operations like checking inventory, sending emails, etc, that you don’t need a user to wait for. In my experience, I’ve seen background jobs take a few different forms. Separate Windows service (or Linux daemon, whatever). A console/service program that’s running in addition to your ASP.NET program. This works fine for scheduled jobs. Queueing mechanisms like Kafka or Rabbit. The ASP.NET program will put messages into these queues, which will then be processed by some other program. This is fine for fire-and-forget. With all these options in the past, I’ve experienced deployment difficulties. The wrong version of the service gets deployed, or isn’t running, or fails silently, or needs to be deployed on multiple servers in order to provide scalability/availability etc. It’s totally possible to overcome these challenges, of course. (I should also note that in my experience with Quartz.NET, I never used it in embedded form, and the last time I used it was probably 6+ years ago). But if I just need a handful of background jobs, I’d much rather just make them part of the ASP.NET system. Yes, maybe this goes against the whole 'microservice' idea, but I don’t think it would be too hard to refactor if you decided you need to go that route. 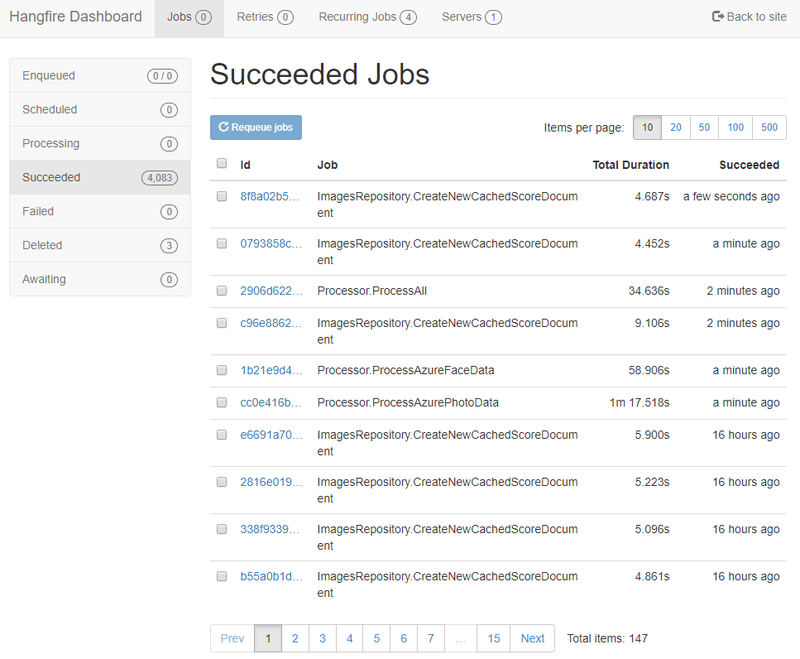 I solve my deployment problems, and as you’ll see with Hangfire (with Couchbase), it’s very easy to scale. I’m using Couchbase in this example, but there are options for SQL Server and other databases too. I happen to think Couchbase is a great fit, because it can easily horizontally scale to grow with your ASP.NET Core deployments. It also has a memory-first architecture for low latency storage/retrieval of job data. Generally speaking, even if you use SQL Server as your "main" database, Couchbase makes a great companion to ASP.NET or ASP.NET Core as a cache, session store, or, in this case, backing for Hangfire. (In my case, it’s just running locally). Note that I didn’t have to implement an IJob interface or anything like that. Hangfire will take any expression that you give it (at least, every expression that I’ve thrown at it so far). Hangfire is just a NuGet package and not a separate process. So no additional deployment is needed. I’m using my own HangfireAuthorization implementation because Hangfire only gives permission to local users by default. 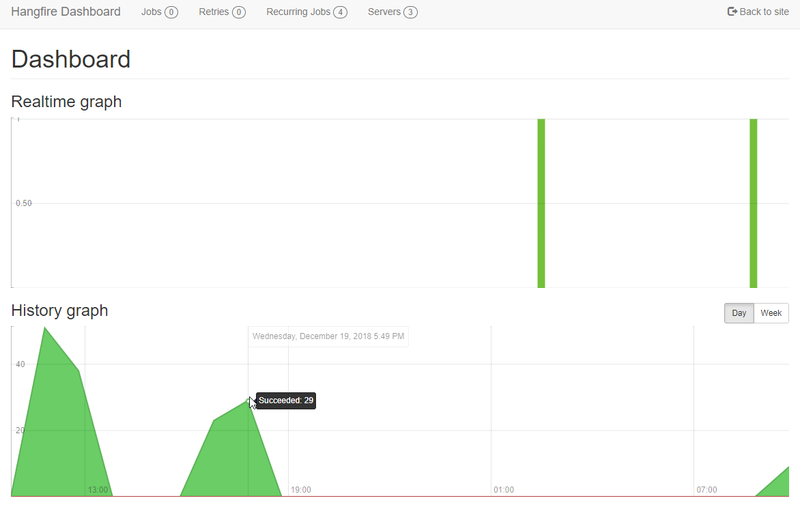 Then, you get a nice dashboard right out of the box, showing you a realtime and history graph. From this dashboard, you can also look at a more detailed history of what’s run and what’s failed. You can even kick off recurring jobs manually. If you’re thinking about adding background jobs to your ASP.NET Core solution, why not give Hangfire a try? Scaling: every ASP.NET Core site that gets deployed with Hangfire that points to the same database will be able to process jobs too. As your ASP.NET Core site scales out, hangfire scales out with it. This is another reason that Couchbase is a good fit, because it’s also easy to scale out as your site grows. Cloud: If you are deploying your site as an app service, note that Azure will shut down ASP.NET processes if they haven’t been used in a while. This means Hangfire will shut down with them. There are a couple of ways to deal with this. Check out the Hangfire documentation. Retries: Hangfire will retry failed jobs. Design your background job code to expect this. Hangfire Pro: The commercial version of Hangfire is called Hangfire.Pro, and it comes with some interesting looking batch capabilities. I’ve not needed any of this functionality yet, but for more advanced cases you might need this. Couchbase: a NoSQL data platform that has a built-in memory-first cache layer, SQL support, text search, analytics, and more. There are lots of options for working with Couchbase in .NET. For this post, I used the Hangfire.Couchbase library (available on NuGet). Last year's C# Advent was a success beyond anything I expected. I was worried that I wouldn't get enough sign-ups, but I ended up turning some people away. I was worried that people wouldn't get their blog posts done on time, but every single author delivered on time. I was worried there would be too much overlap in topics. There was a tiny bit, but every author's post had a unique, quality perspective, even if there was some overlap. So, I'm doubling down this year! Each day of the Advent calendar will have up to TWO blog posts. That means that there is a maximum of FIFTY slots! So, tell your C# friends and let's fill up this calendar. A little history: I heard about the F# Advent Calendar, a tradition that's been carried on since 2010 (2014 in English) and is still going strong in 2018. I think this is a great idea, and so I organized one for C#! (I asked Sergey Tihon for permission!). Other Advent calendars: C# Advent Calendar (in Spanish), Q# Advent Calendar. So, I need you to write a C# blog post! Reserve a slot on Twitter (with hash tag #csadvent) or leave a comment on this post. You do not have to announce your topic until the day you reserve. Prepare a blog post (in English). Add a link in your blog post that links back to here, so that your readers may find the entire advent. Publish your blog post on the specified date. Your post must be related to C# in some way, but otherwise the content is completely up to you. I've posted a few ideas below to get your creativity flowing. Below are all the slots, and who has claimed each date. I will do my best to keep this up to date. The slots will be first come first serve. I also allowed last year's authors to get first crack. I have already claimed one of the December 25th slots for myself, but I can be persuaded to change if you really want that date. IF ALL FIFTY SLOTS FILL UP, please leave a comment or tweet with #csadvent anyway! I will put you on this 'standby' list in case someone drops out or can't deliver their post in time. 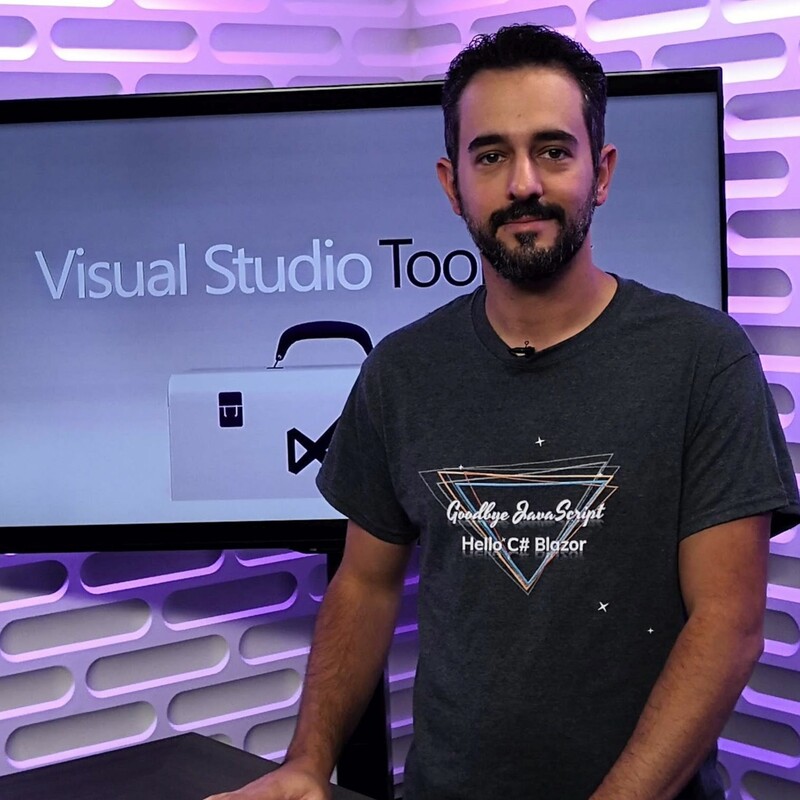 Introduce your favorite NuGet package / library. Even if it's a library you take for granted, not everyone has heard about it. Create a video tutorial and embed it in your blog post. Interview someone about C# and embed an audio player in your blog post. Thanks to everyone who is participating! If you were an author of a C# Advent blog post in 2017, you get a chance to sign up earlier than the general public. Tweet #csadvent or leave a comment below with the date you want to blog on. Note that this year, each day has up to TWO slots. So if someone has already claimed the day you want, that day may still be available. The general call for C# Advent authors will go out next week, so claim your dates as soon as possible. Just like last year, you do NOT have to pick a topic right now. If you DO want to pick a topic, I will pencil it in, but you are free to change it at any time up until the date you pick. 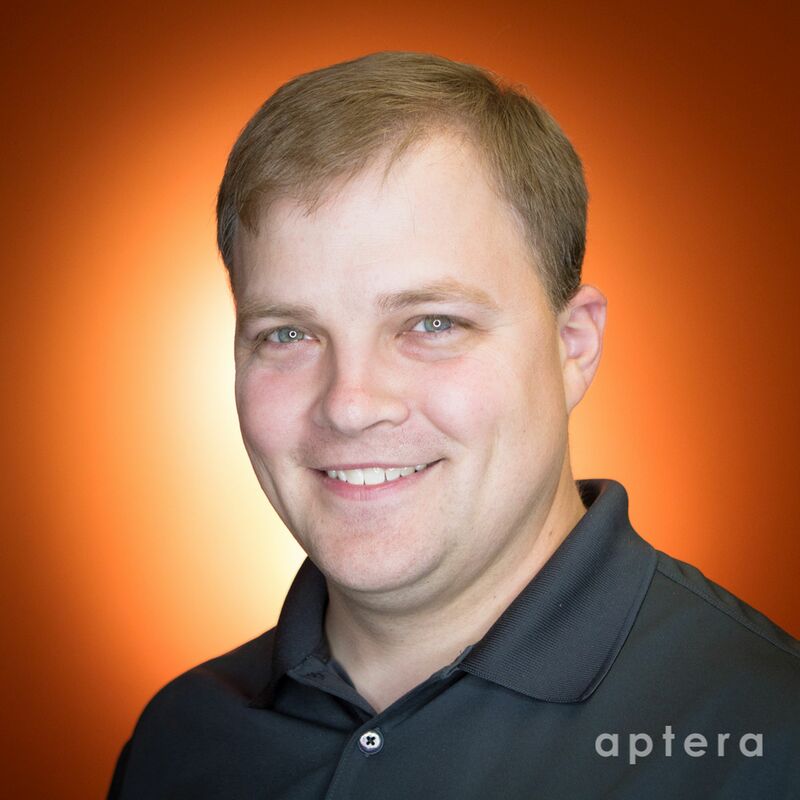 Ed Charbeneau is writing SPA with Blazor. This episode is sponsored by Smartsheet. WebAssembly (aka Wasm) 1.0 has shipped to all the major browsers. Mono is an open-source implementation of .NET. The term "evergreen browsers" has been around for some time. It may have been popularized by Paul Irish. Ed Charbeneau is on Twitter. Eric Potter is writing code to play NES games. This episode is sponsored by Smartsheet. Check out the NES AI videos from Tom7. I reference part 2 in this podcast. Check out starting at 18:11 especially. ROMhacking.net which includes memory locations, translations, and more.